I fell in love with volunteering at the Veterans Restoration Quarters a few years ago after some of my coworkers and I signed up to help cook and serve dinner there. As soon as we walked in, the residents and staff were all so kind and welcoming. I remember one man in particular. As we sat and talked, he told me his life story and I shared mine. We were two people sharing life as we enjoyed sweet tea and bread over a friendly conversation. He was grateful we were there and I felt just as grateful to be volunteering that night. I knew I would keep coming back to serve at the VRQ because the people there reached my soul. The VRQ has opened my heart to those in the community who are homeless and just need to know they are loved. It’s my resolution to continue serving at the VRQ, as well as, encouraging my team to serve the Veterans and those who are homeless in our community. Thank you ABCCM and all its supporting churches for changing my perspective on what a missional community looks like and for helping my faith to grow through service to others. In my few months here at the Medical Clinic I have been introduced to some pretty amazing volunteers. Community leaders, professionals, laborers, retirees and students have all come to satisfy a particular need in their lives and to gift us with their marvelous talents and their valuable time to help those uninsured residents of our community in need of medical care. Some come to try on the fit of volunteering; some come to garner experience; some come to fill that opening in their daily lives that calls for service. For most of our volunteers it’s a resolution they made a while ago. They are at the point where they have shown that beyond their resolutions is actual resolve. Case-in-point are the volunteers who so generously offered to accommodate us when our Clinic had to close its doors one day a week in answer to budget cuts. Without missing a (heart) beat, they graciously amended their scheduled days of volunteering to continue to meet the needs of keeping medical supplies maintained and inventoried; in keeping our health records maintained for accurate documentation; in maintaining our building for sanitary service; and in continuing to provide professional hands-on medical care to those in our community with no where else to turn in times of financial hardship. This week Dr. Campbell, who serves religiously at three clinic sessions a week, told me he would be out of the clinic on vacation for six weeks. What blew me away was what he requested next. He asked me to locate a free clinic operating in the area where he was vacationing so he could volunteer there. All these volunteers have grown into their practice of service. Each has made it unique in bringing their special talents and identity to the position. They grew into their commitment and have become more valuable citizens in the act of caring for our neighbors and have enriched their own lives through the gift of service. Is volunteering among your resolutions this year? Whatever your passion, find a way to channel it into service to others as a way to enrich your life. We would welcome you here at ABCCM Doctors’ Medical Clinic and encourage you to come by for a tour to see how you could engage your talent with us in volunteering. Will your resolution start a revolution? “Jesus steadfastly set His face toward Jerusalem.” Luke 9:51. This simple statement changed the course of history. Jesus chose to go to Jerusalem, and take his disciples into the very place that they knew they should not go. It was dangerous, it was going to be hard, and it would require some sacrifice. The disciples had recently come back from being sent on a journey where they healed all manner of sickness and even cast out demons. Then they were part of Jesus feeding the 5,000 with just five loaves and two fishes. Jesus asks us all, “Do you know what manner of Spirit that you are of?” – or better translated, “.. what manner of Sprit is in you?” Do you know that you have the power to forgive? Do you know that you have the power to transform or restore a life? Do you know that you have the power to offer someone Grace, who does not even deserve it? In a world that is hung up on who is deserving, we must ask ourselves honestly, were we deserving? Jesus started a revolution in how to set goals by ‘setting His face’ toward the greatest act of forgiveness in history, by going to Jerusalem to die on a cross. Then He does the unthinkable, the impossible, by being raised from the dead and offering that Grace of forgiveness to everyone who doesn’t deserve it. His resolution started a revolution. What have you set your face toward in 2019? Would you consider setting your face toward Jesus? If you would feed the hungry, you would feed Jesus. If you would visit those incarcerated, you would visit Jesus. If you would clothe those who are without, you would clothe Jesus. If you would serve the homeless, you would take in a stranger named Jesus who “had no place to lay his head.” The sacrifice of your hours to share could be dangerous, risky, even life changing for those the world has already judged as undeserving. When we go against the norms, we are part of a revolution. I remember Lynn McKinney telling me that if her mama knew where she was feeding the hungry downtown, she would spank her for going in to a place like that. To the world it does not look safe, but that is what ABCCM does, creates a safe place for the hurting and the servant to be together in a way that offers His grace, His love, and His hope. Would you respond to ABCCM’s resolution? Our resolution is to find one more person who will volunteer, who will give a few hours a week, or once a month, or once a quarter, or even once a year to care for someone that Jesus cares about – very much. You will read throughout this newsletter how others feed the hungry and homeless, how a life was changed during a Bible study at the jail, or how life skills and a job resulted in a new home for a homeless Veteran or a mom and her children. You will see how highly skilled doctors and dentists and pharmacists come together to give healing for uninsured patients that you and I can not only pray for, but can stand side by side with these who serve. To do any one of these servant leader roles is to change the world and support the quiet but powerful revolution of a Man who set His face toward Jerusalem. Will you ‘set your face’ toward serving in 2019? Our resolution is to find one more person who will volunteer, who will give a few hours a week, or once a month, or once a quarter, or even once a year to care for someone that Jesus cares about – very much. Around this time every year, you can hear people say, “Come to Bethlehem,” or “It’s time to go to Bethlehem.” It is when we see the Holy Family and the babe in the manger that the deeper meaning of Christmas comes to us personally. As Brad Owen reminds us often, this is the story that came TRUE! Aren’t we glad that Jesus came to the farthest reaches of the Roman Empire, and to one of the least towns in Israel/Judea; and to the lowest class of people, shepherds, in the middle of the night? If He will do that and then come in the most vulnerable form and expression of Love as an infant, then maybe He really does want to meet all of us in our most vulnerable place(s). Our thanks to all who hear His call, hear His angels sing, who care for Him. A Great Big, Incredibly Huge Thank You! Sometimes, offering a “Thank You” does not seem like enough to express our deep, heartfelt gratitude when volunteers truly go above, beyond, and out of their way to help us! 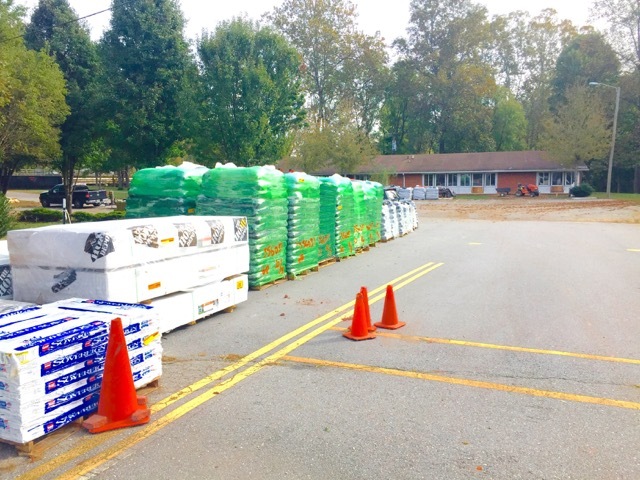 So, all at ABCCM and the Veterans Restoration Quarters want to send a great big, incredibly huge THANK YOU to all 388 people from Home Depot who came from all over the country – and even from Canada on Wednesday, October 24 for a Home Depot Service Day at the Veterans Restoration Quarters (VRQ). Because of the generosity, sacrifices and hard work, the lobby of the VRQ has been renovated with new floors, furniture, ceiling tiles, and a make-over of the front desk. In addition, the Azalea Community Training Services (ACTS) Building is being re-commissioned. This is huge! Once the ACTS Building is back in service, we will once again be able to house life-skills and other vital classes to nearly 1000 veterans and civilians each year! Home Depot volunteers also built gazebos, fences, benches and a walking trail that covers the perimeter of the VRQ campus. These volunteers also erected a greenhouse in our garden, and gave us 5 storages sheds. And the list literally goes on! It is because of gracious people like our friends at Home Depot that we are able to help transform the lives of hundreds of people each year. You are so special to all the Veterans who were truly touched by your generous gift. The staff and volunteers will be singing your praises along with the Veterans for many years to come! Romans 15:1 We who are strong ought to bear with the infirmities of the weak and not to please ourselves. Each of us should please our neighbors, for their good, to build them up. For even Christ did not please Himself v5) May God who gives endurance and courage give you the same attitude and mind toward each other that Christ Jesus had, so that with one mind and one voice you may glorify God and the Father of our Lord Jesus Christ. There is common ground at ABCCM when people in the community come together with our churches and people of faith with one mind and one voice to serve our neighbors with critical needs. With so many voices calling for greater unity and civility, we want to invite you to a place that is accepting, caring and compassionate for those who want to serve by volunteering, just as we care for those coming through our doors that need hope and healing. At the core of ABCCM’s founding and day-to-day service is gathering around a common table. It may be to serve food through our daily meals, or it may be to offer boxes and bags of food so families can serve their children. It may be spreading clothes out on a table to find just the right size and fit for a mom’s school children; or for the homeless who need fresh clothes; or for the student that has graduated and going for their job interview. It may be asking a patient to sit on an exam table where they are being served by doctors and nurses from sometimes competing practices, but now collaborating their skills to bring the best degree of healing. It may be opening the Bible at a small table in the county detention center where people from different churches combine to bring light into a dark place, to illuminate greater meaning and purpose for these lives. Although the news media may make us feel like the noise and shouting about issues and legitimate problems has us more divided than ever, ABCCM is a respectful and peaceful place where we come together with compassion and caring that transcends the noise and violence of the world to be a safe place for women and children who have already had to endure and survive abuse. It is a safe place for Veterans to heal from their traumas and to discover their greater potential. In all these ways, ABCCM invites you to be a part of bringing your gifts and strengths to this common table in our community. We have lots of tables to gather around, and hope that you will find a few hours in your life, in your month or in your week to come be a part of us. You will discover hundreds who are thankful for such a place where their lives fulfill the call to care for the least of these – and experience the Christ. ABCCM Crisis Ministry at 24 Cumberland Avenue is a unique and spirited place. I had the opportunity to volunteer there this week and had an inspiring experience. The moment I arrived, I stepped into a kind of happy chaos. I was welcomed with enthusiasm and warmth and assigned to the kitchen, as that was where the need was most immediate that day. There were many guests who came through the line and took notice of my newness, and their gracious, welcoming smiles helped make the whole experience deeply meaningful. I felt like I was part of an established community that regularly converges to enjoy a sense of fellowship and fun. It allowed me to transcend my own particular worries and preoccupations that day – my small world with its concerns – and enter into a larger space. Providing hearty meals to people in need is a type of service work that dates back centuries and is still widely performed, in part because the benefits are so immediate. In this area of ABCCM, though, not only is the basic need for sustenance amply met, but also the need for belonging, sharing and companionship. I appreciate the physical action of preparing and serving someone a plate of hot food; it felt like a very kind act yet it was so simple. But, the highlight of my day was spending the afternoon with some of my neighbors who call the streets and shelters of our beloved downtown Asheville home. I thoroughly enjoyed the interesting guests we had that day. They were appreciative, intelligent, and fun, with a couple of them even breaking out into a few bars of a song. This greatly lifted the energy of the room for everyone. of time. Often, we so are busy that we feel as if there is no time to accomplish the myriad of tasks before us. Because of this, there is no room in our daily schedules for one more undertaking. But, if that one undertaking involves volunteering for an afternoon, it changes one’s perspective. While serving at ABCCM I realized that not only did I have the time, but the time I spent providing the service took on such value that it transformed the time I later spent on other activities. Sitting in the hallway of Steadfast House was a nervous and anxious young lady who had just escaped an emotionally abusive situation. To make matters worse, Hurricane Florence was threatening Wilmington, her hometown just when she left. She was grateful for shelter from both the abusive relationship and the storm while she told the volunteers her story, including her fears about her home potentially being underwater. Just like those who watch a storm, volunteers watched this young lady slowly adjusting to her new life at Steadfast House. She has bonded with some of the residents and has been slowly working toward renewing her trust, becoming stable and overcoming her struggles. It wasn’t too long after her arrival when a volunteer noticed that she had settled in completely as part of the family of Steadfast House. After lunch was served and all was cleared, the volunteer observed cook team members and residents still in the dining room. They had all joined hands; they were praying and singing. The young lady who had fled a tumultuous storm and relationship was finally experiencing the peace she needed. Thankfully, the grace of God – along with the love and commitment of our regular volunteers had brought that measure of peace to her. Beginning November 1st, the clinic will reduce its hours by eliminating services on Thursdays. The Medical Ministry will now be open Monday and Tuesday from 8:30am to 8:30pm and Wednesday from to 8:30am to 2:30pm. Only one clinic session per week (Thursday evening) will end, so that we will have five sessions on Monday and Tuesday mornings and evenings; and also on Wednesday morning. We believe we can increase the number of patients seen during those sessions to maintain our capacity. These reduced hours will allow our staff to retain their benefits. The dental clinic services will also be cut in half to only offer extractions on Monday night, eliminating services on Thursday. If the need continues to overwhelm us, and if there is enough support from our churches, volunteers, individuals, and others in the community, we could consider adding dental services on Tuesday. Every day, a person walks through one of our doors who is in the middle of a crisis. A volunteer sits down to first listen, then compassionately engage and offer some wisdom that has come out of their own struggles, their own time of suffering. Alcoholics know how to talk about recovery, because recovery is hard and to overcome addictions requires knowledge about it, along with self-control, a great deal of perseverance, and reliance on God’s strength every day. One thing that makes ABCCM unique is our reliance on volunteers and our insistence on having volunteers lead each step in each Ministry. We might say it is because of the different gifts in the body of Christ…and we would be right…but at a deeper level it so the Holy Spirit can connect those who have endured similar sufferings and trials with those who are facing them now. There is something so powerful when a person we look up to says, “I’ve been through what you are going through now and my healing began when I realized I could not do it alone…” On many occasions, I have heard people say, “I didn’t go through all this just for me, others have to know and know they can overcome too.” So often our faith grows in the midst of trials or suffering and that inspires a great gift which is to give back to others. What we have learned. Peter’s statement ends with “..and to mutual affection, love. “ Paul’s statement ends with, “And hope does not put us to shame, because God’s love has been poured out into our hearts through the Holy Spirit, who has been given to us.” The process always ends with us needing each other more, realizing that we all have something precious to share out of our own life experiences. Our churches give back every day at ABCCM through their volunteer missionaries. ABCCM is a place that makes it possible for us to share our faith with neighbors we don’t know, which means to share our trials, our suffering, our struggles; then grow both in love for one another and in our Love and Reliance on God. If you’re a Veteran, then some of the most vulnerable Veterans are at ABCCM. If you experienced recovery, then come help someone recover. If you are a survivor, then come help someone survive. If you have been poor, then come help the poor. If you have been sick, then come offer healing to the sick. Your neighbor needs you. God needs you to connect with your neighbor. Call us at 259-5300 or through volunteer@abccm.org. Out of resources and savings, she sold everything she could to get her family by since losing her job last winter. Stretching her disability check as far as it would go, it still wasn’t enough for the young mother of four to make rent for the month. Doing the most she could with what she had, the young mother lacked $300 for her August rent. She quietly insisted to the Crisis Ministry volunteer counselor that whatever assistance she could receive would be for this one time only. The stress and frustration of this young mother was exacerbated by the metastatic cancer ravaging her body. Without any support or family, she carried her family’s financial burden alone, leaving her drained from any energy to focus on her healing. The young mother’s story is one that breaks your heart, easily taking you down the path of hopelessness for her situation. But her story reminds me that of my friend Jen, who will tell anyone that ABCCM’s medical clinic, saved her life. Jen’s story is much like the young mother’s; she was without family and caring for a six month old baby when the medical clinic diagnosed her cancer. Without any form of insurance she didn’t know how she was going to handle her treatments. But before her panic could set in, a volunteer nurse, along with network resources, had arranged for Jen to receive treatments at no cost. The nurse and volunteer counselors working with Jen did more than offer her a list of resources and medical care - they gave her hope. She attributes her healing to the clinic’s early detection of her cancer and the counselors who helped her navigate an otherwise frightening ordeal. We don’t know how she was able to parent four children alone while going through exhausting treatments. We can’t imagine the pain and fatigue she has to push through to be there for her family. However, we can imagine the hope that will replace the desperation she had for ‘this one time’ assistance. We imagine her relief when the counselor looked beyond her immediate need and addressed the long-term. For the young mother of four, she will receive more than she hoped for, connected to various resources and a church community so she doesn’t have to go it alone. By the grace of God, she will receive hope beyond tomorrow and the opportunity to place attention on her healing. We imagine, we hope and we pray that she received her answered prayer for a better tomorrow. The joke in our family is that no matter how well we plan, or make our list, we can never go to the store just once. A recent example in fixing up my son’s apartment happened when we needed to install some trim board. I went to a home improvement store and purchased the exact design. When I got back home, it was the wrong thickness. I went back to the store and got the right thickness. The first cut I made was too long. The second cut was too short. I went back to the store and got another piece. Proverbs 19 is chock full of other important sayings like … Listen to advice (my wife would say: don’t grab the first thing you see and my son would say: measure twice and cut once). Our Crisis Ministry volunteers hear stories from our neighbors whose plans were derailed by life circumstances and now they are turning to the churches – and God – for answers. We hear from moms that their kids are eating more, and they need help with food. We need our churches to help with food. Our downtown Crisis Ministry has seen as many as 70 families in one day coming in for food – on top of 120 homeless persons coming in for lunch. You can imagine how many thousands of pounds of food go out of our door in one day. There are many groups collecting schools supplies but our families are also looking for clothes and underwear for their growing children starting school. ABCCM also needs your church’s financial support because in July, we have had 8 families who were going to be evicted. It is much cheaper to keep a family in the home or apartment they have – and can afford, than to have them go through eviction, the cost of moving and having to set up all the utility deposits again. The ABCCM Pharmacy at 356 Biltmore Ave. is purchasing meds to help bridge the gap in medications for those in crisis. We work closely with other mental health providers in town like RHA, Family Preservation, October Road, All Souls Counseling Center and others to provide these medicines. You may want to consider having a medicine bottle drive. Ask everyone in the church to bring one of their medicine bottles – filled with quarters (possibly dollars) to help provide hope and healing for our working uninsured. Our homeless ministries continue to serve those on the streets. We have had such a high influx in transient folks this year that we are also running out of basic hygiene items such as shampoo, deodorant, toothpaste, toothbrush, razors, and other hygiene items. You may want to consider putting some of these personal kits of hope; or our women may want to put together ‘handbags of hope’ for homeless women and moms. We have a number of school-age children at Steadfast House and it is always helpful to provide some backpacks and school supplies. While we have a number of agencies providing them for our schools, we appreciate the thoughtfulness of offering these to our families in need. School supplies are a need throughout the school year. Proverbs 19:14 says, “When we show kindness to the poor, we lend to the LORD.” When we go the extra mile while shopping for our own children or grandchildren’s school supplies; or shopping at the grocery store; or passing on great clothes and shoes that have hardly been worn, then we are doing more in caring for our neighbor – we are also serving God and His calling. There is a strength and peace that comes from that kind of loving our neighbor that does not come from any other place. As you read the other articles in this newsletter, we hope you might be inspired to volunteer and share a few hours or throw a little extra in your shopping basket to help our neighbors in need. With wife Julie hand-in-hand with Ricky Johnson, I led the couple across an arched wooden bridge in the lush Botanical Gardens near UNCA. We all sat together on a rough-hewn stone bench aside a creek to unfold how the two of them crossed a bridge from a life of darkness and uncertainty and into a life where the hope for change became real. Julie’s life journey as a child in Southern Missouri was amazing in terms of how God put them together both individually in spirit and as a married couple. “I prayed God would drop someone into my life who understood me.” Julie knew Ricky was the one God had sent into her life. However, initially meeting Ricky in the rehab program in which she was a counselor, she was puzzled by God’s answer, “What in the world was I doing? This is crazy.” While in the program, they kept apart, with Ricky seeing other counselors. However, upon Ricky’s program completion, and the more they both prayed, Julie realized this was it. Ricky then reiterated, “Like I said, she saved my life, but I knew I needed to make serous changes to make this work.” Though Ricky is a man who exudes determination, in our conversation in the early evening amidst the flowers at the Botanical Gardens, Julie is his match. She’s like “quiet dynamite.” Throughout their courtship and even into their marriage today, they share scripture, their hearts, and their plan for the future. That reliance on God and each other led them to work through the next stages of Ricky’s recovery, marry, and eventually move to Ricky’s home state of North Carolina. Ricky Johnson successfully worked out of rehab and into a halfway house he affectionately called “The Mission.” Their relationship continued to grow, the intensity of living at The Mission with others men in varied stages of recovery and relapse was an indication to Ricky that he needed to accelerate moving through this stage of life. He recalled, “It was an important step to live there, but I got sick of it, and I couldn’t stop thinking of her [Julie].” They did find ways to talk on the phone and share their mutual love for the Lord, the values and plans for a future, and their love for working out. Ricky also helped Julie find her voice and, “…stand up for herself,” while Julie helped Ricky find serenity and peace and break away from the excitement of a chaotic life. God’s peace was made real when they were together. After they married, Ricky like many people with criminal records, though making tangible progress with great drive and skills, was turned down from several jobs. Mr. Johnson avoided self-pity and instead used his gifts and talents to spur others into recovery through YouTube videos, one-on-one talks with guys at the gym, and working for whomever would give him a chance. Julie Johnson discovered a counseling-type job in Asheville at a medically assisted opioid addiction treatment center. Both Ricky and Julie knew God was moving them to the next place to flourish for Him. Weeks after arrival, Ricky Johnson attended a Marine Corp League meeting, met ABCCM’s Director of Veterans Services of the Carolinas (VSC), Brandon Johnson. Ricky’s passion for recovery, determination, and talent as a communicator led to Brandon connect Mr. Johnson to North Carolina Peer Support Training and eventually to employment at ABCCM. Ricky Johnson is ABCCM’s first “America Serves” Peer Navigator for our Veterans seeking and maintaining living-wage careers, housing, and community connection. Earlier in the same day of this interview, Ricky worked with his first ABCCM client, an elderly Marine with landlord issues. But Ricky Johnson knew this man needed more. He needed someone to hear him out, not feel weak for seeking help, and connection to the brother-hood of hope offered through VSC and ABCCM. Ricky was equally excited to meet the next and then the next Veteran on his caseload, and be God’s living hope to Veterans who have lost hope. Ricky sees his work at ABCCM as more than a career, “I see a lot of potential working with VSC…God placed me here where…iron sharpens iron. Here I can motivate others to learn that they have potential and be accountable and compassionate in their own lives.” The three of us left the Botanical Gardens by crossing that same arched bridge back to our cars. It reminded me of the bridge Brandon crossed out of chaos and prison to a wife and a career with ABCCM. It’s now Ricky, Julie, and all of our turn to hold some hands of those in need and through ABCCM together cross a bridge into a new their life.